Donald J Horowitz: Okay, let me, let me be very candid with you. Some people say you’re a woman, so that is why you are, you know, made this opinion or whatever. I think myself, of course you are a woman, you are a judge, and a judge learns how to be impartial. DJH: Perhaps we can never be totally objective but we can learn to be impartial, which is our job. And you ca-, you had this women’s group as well, who, that, you know, made you interested in what was happening to the women, as many of us would be, for other reasons, in human rights or whatever. DJH: I want, so I want to ask you the personal question if you will: what do think – how do you think, if you can express this, your approach to this may be the same or different from other judges? And there are other women on this court; I have interviewed some of the others, so maybe that’s not a fair question but do the best you can, or you don’t have to answer it. Eh bien, vous voulez savoir quelle est mon approche en tant que femme juge, c’est cela? Interpreter: Do you want, do you want to know what my approach is as a female judge? Is that what you want to find out from me? DJH: I want to know if it, if you believe it is affected by – other people say this, I am not, I am simply passing along. It sometimes happens that because somebody is something, whether it’s an ethnic group or a gender group that others will say, “Oh, sh-, he or she is doing it because of this reason, not because of this reason.” And it’s my, I must ask the question how you respond to that. Non, je pense que si on est un juge, il n’y a plus de femme-juge ou d’homme-juge, on est impartial, on a un devoir à assumer, alors je pense que vous parlez des sentiments, non, les sentiments ne comptent pas, c’est, c’est la justice qui compte avant tout. Interpreter: I think that when you’re a judge, we no longer talk about a female judge or a male judge, you have to be impartial and you have to perform your duty with impartiality. Talking about feelings, feelings do not count, actually. Oui, yes, I just add that there are no feelings, but you are a judge avant tout. Interpreter: Above all you are a judge . . .
DJH: First . . .
Interpreter: Foremost . . .
DJH: First, yes, I understand, I un-, I very much understand. There was another – and then I’ll leave this subject, but I, there has been a story somewhat written about where there was a case in which some wo-, a woman was describing what was, happened to her and one of the judges su-, was supposed to have laughed, rire, and I am told, and I don’t know this, that you were present when that happened. Wha-, did that actually happen? Je voudrais vous dire que ça ce sont des, des choses que les journalistes, ce journaliste d’ailleurs, a raconté, et c’est faux, complètement faux. Cela a été nié par notre, le Président de ce tribunal, il y a eu un démenti. Mais voilà, le problème c’est que c’est cet article qui a valu, plutôt que le démenti. Et bien sûr, vous savez quand un journaliste, je ne veux pas dire du mal du journaliste, mais je vais vous citer un exemple qu’il a également écrit à mon sujet. Il a écrit par exemple que j’allais passer des vacances à Madagascar et que c’était, comment dirais-je,c’était, alors que c’était un break légal et officiel, et que j’allais passer des vacances en Irlande, alors que c’était un séminaire des juges internationaux, tous les juges y étaient. Moi, je venais d’arriver. Alors je ne, je n’ai pas compris, mais je n’ai pas répondu, nous avons un devoir de réserve, nous ne dirons rien, ils peuvent dire ce qu’ils veulent. En tout cas moi, personnellement, j’ai pris cette, cette position, malgré que même tout le monde, enfin beaucoup de gens sont venus me dire: « il faut, il faut », mais nous sommes maintenant en plein délibéré, nous ne pouvons absolument rien dire. Et vous êtes juge, vous savez ce que c’est que le devoir de réserve. Comme dit ce proverbe, les chiens aboient mais la caravane passe. Interpreter: There’s something I’d like to tell you. These were stories written by that journalist and such things never happened. DJH: It was false, I heard you said false. Interpreter: Yes, it’s completely false, and in fact there was a disclaimer sent out by the President of the tribunal. But the unfortunate thing is that it is the article written by the journalist which was given more attention that the disclaimer itself. (_______) . . .
Ce que je veux dire, le démenti n’a pas été publié quoi, n’a pas . . .
Interpreter: What I mean is that this disclaimer or, you know rejoinder was not published. Interpreter: Yeah. Let me tell you some other things which that journalist wrote. The journalist said that I went to Madagascar, to spend my vacation; I went on holidays in Madagascar, whereas it was a legal and official break period of the tribunal. The same journalist wrote that I went to Ireland for holidays, whereas it was an international seminar bringing together judges, and all judges were present, (___)? Interpreter: But you see, at that time, I had just come – and we as judges, we have this duty of discretion, you know, confidentiality when handling matters and that was the position I took. Even though, you know, people came and saw me and said, “Well, you have do this, you have to do that,” my position was that I am going to abide by my duty of discretion and confidentiality. And even you as a judge, you know that that is what counts, because now we are really deliberating on serious issues so we cannot allow ourselves to be distracted by such things. Note: This portion of the interview has been redacted. Duration of redacted video: 16 seconds. DJH: Thank you, thank you, merci for, pour l’explication. Oui, oui, vous savez ces choses, en tant que juge vous le savez aussi, vous avez les gens qui vous – ces choses ne me, ne me troublent pas du tout. DJH: C’est, c’est dificile, yes. C’est parce que vous allez en votre âme et conscience, vous avez votre âme, et vous avez la, vous avez votre conscience tranquilles, et je pense que pour moi c’est une joie et un bonheur d’avoir l’âme et la conscience tranquilles. Interpreter: You know, I’m not at all (________) by these (______), because you have your conscience, you have your clear conscience and for me it is really gives me pleasure and joy to know that my conscience is clear. 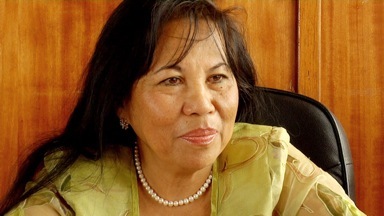 Note: Judge Arlette Ramaroson was unanimously elected ICTR Vice President by the ICTR Appeals Chamber Judges in The Hague from May 2005 to May 2007.